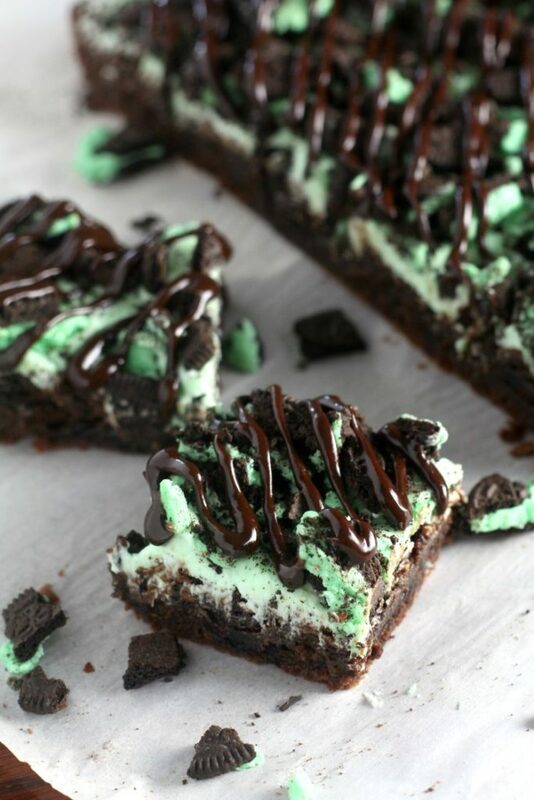 Mint Oreo Brownies are stuffed with mint Oreos, spread with mint frosting, and topped with more mint Oreo’s and a fudge drizzle. What are your thoughts on special flavors of Oreos? Yay or Nay? I love trying them and there are some I love, hello lemon and cookie butter. And some I never want to taste again, goodbye apple pie and birthday cake. I’ve seen most of these flavors come and go, but mint Oreos must be a perennial favorite because you can always find them in the store. Thankfully, because I like them better than regular Oroes. 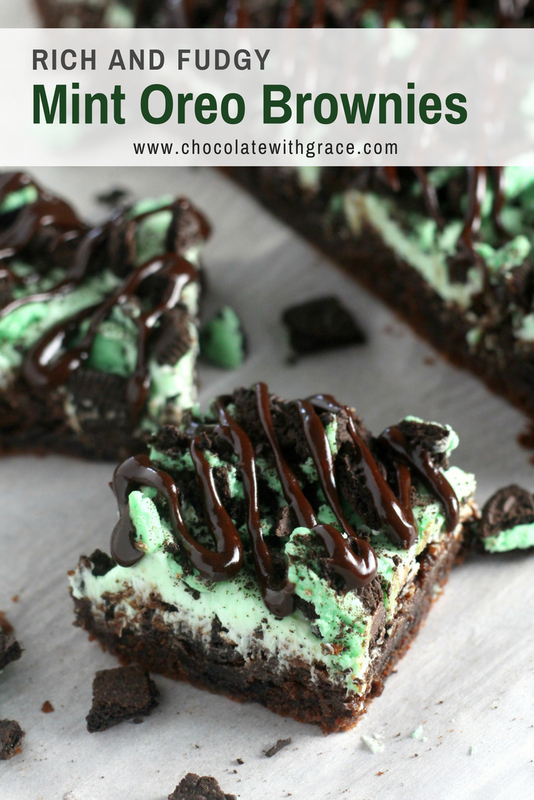 My recipe for mint oreo brownies uses a whole large package of mint oreos. Better buy two packages, one package for the oreo sneakers, one to make the brownies with. You wouldn’t want to get around to making them to find out the package had been broken into. The brownie base is my simple cocoa brownie recipe. I use it in this recipe for mint brownies with chocolate ganache. Then layer half the batter in the pan and press in 24 whole mint oreos. Spread the second half the batter over the top, bake and cool. While it’s cooling whip up some mint buttercream. Spread the mint buttercream on top, crumble up the remaining oreos in the package and sprinkle on top. Last make a 30 second fudge drizzle in the microwave to add on top for a finishing touch. Cut, serve and enjoy – up to 4 per person 🙂 Check the full recipe out at the bottom of the post. Because I love mint oreos so much, here are some other recipes that use mint oreos. 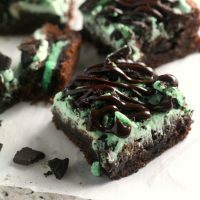 Just in case you should have some leftover mint oreos because you were crazy and only made a half batch of oreo brownies. This Mint Oreo Fudge from Spend with Pennies looks super easy and would be great around Christmas time too. This recipe for Mint Chocolate Oreo Stuffed Cookies from Chelsea’s Messy Apron starts with a Brownie Mix for an added shortcut. I’m always up for a good no bake cheesecake and this Mint Oreo No Bake Cheesecake from Yummiest Food sounds amazing. And just in case you are feeling extra ambitious, here is a recipe for Homemade Mint Oreos from Crazy for Crust. 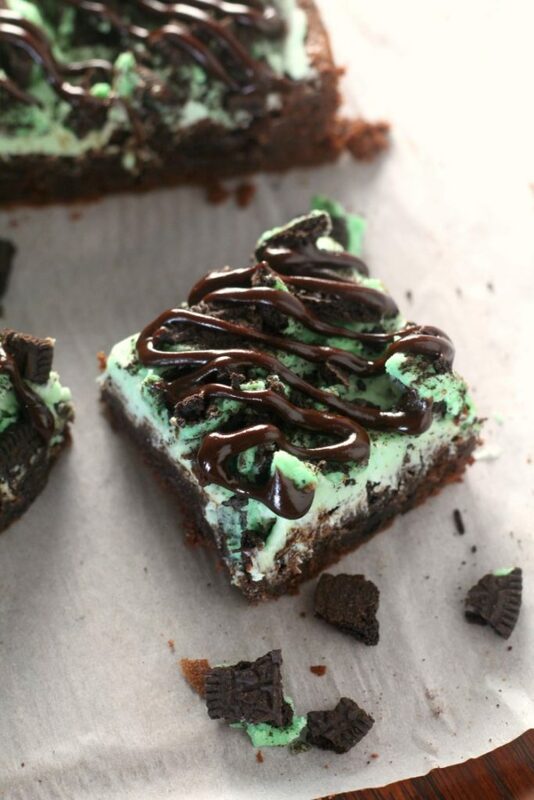 Mint Oreo Brownies are stuffed with mint Oreos, spread with mint frosting, and topped with more mint Oreo's and a fudge drizzle. To make the brownies, preheat oven to 350 F. Grease and flour a 9 x 13 inch pan. Melt the butter in a large microwave safe bowl. Whisk in the oil, sugar, eggs, vanilla and mint extracts. Beat in the cocoa, flour, salt and baking powder. Spread half the batter into the prepared pan, layer on 24 whole mint oreos and spread the second half of the batter on half. Bake for 25-30 minutes or until an inserted toothpick comes out with a few crumbs. Let cool completely. To make the mint buttercream layer, beat the butter in a stand mixer for 1-2 minutes, beat in the powdered sugar. Add enough of the milk or cream to be a spreadable consistency and the mint extract to your tastes. Spread on top of cooled brownies. Gently crush the remaining oreos in the package and sprinkle on top of the frosted brownies. to make the fudge drizzle, melt the butter in a medium microwave safe bowl. 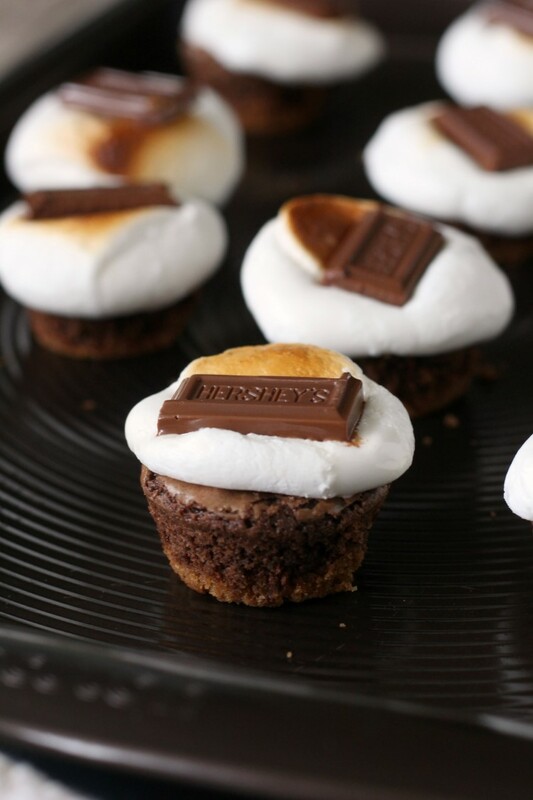 Stir in the cocoa powder, corn syrup, powdered sugar, and enough milk or heavy cream to make a smooth consistency. Microwave to 20 seconds and stir. Drizzle on top of cooled brownies. I put mine into a ziploc bag and cut the corner off for a more controlled drizzle. Let cool and cut into bars. 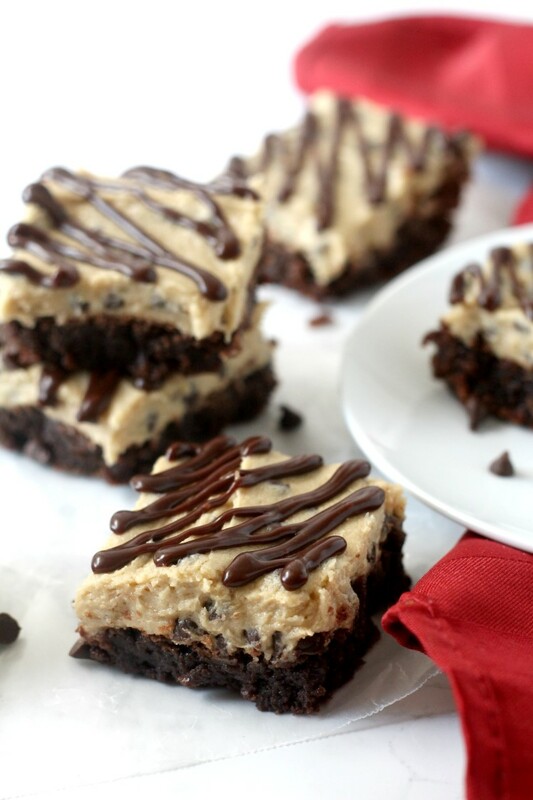 After you’ve made these, check out some of my other favorite brownie recipes. 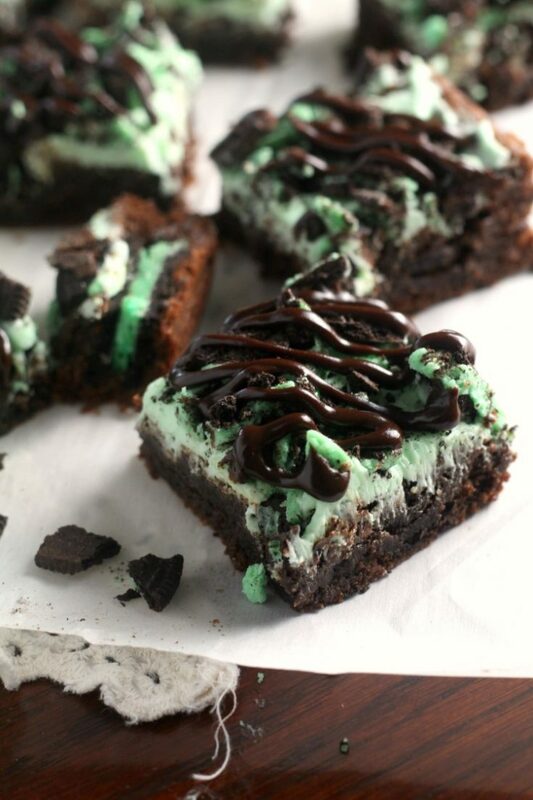 Mint + Oreo+ brownies!! This is the trifecta of deliciousness! Yum!! I just stumbed onto this post at 1:20am!!!! Not fair!!! Drooling! How can you do this to me? It’s 12 midnight and now I am craving! 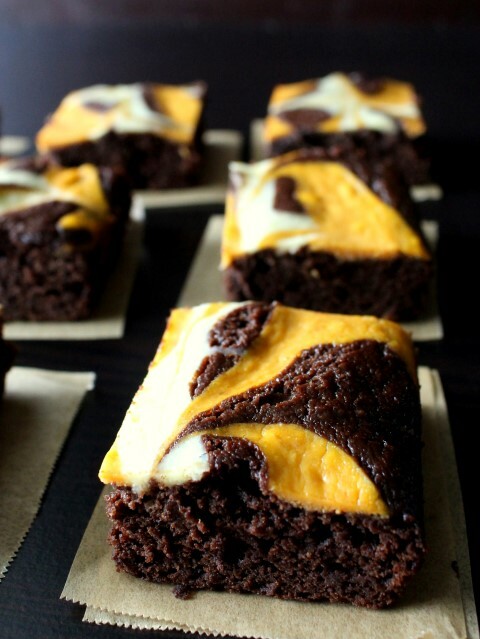 Those brownies look amazing! Love the combination of mint and chocolate. Oh my goodness!! These sound amaaazing!! I am loving the mint and oreo combo! !